If you look forward to Timehop‘s daily email telling you what you were doing on Twitter, Foursquare, Facebook and Instagram a year ago, Memolane‘s latest feature could well be for you. The ‘social timeline’ startup has started emailing users with their day’s posts on a number of services from years gone by. 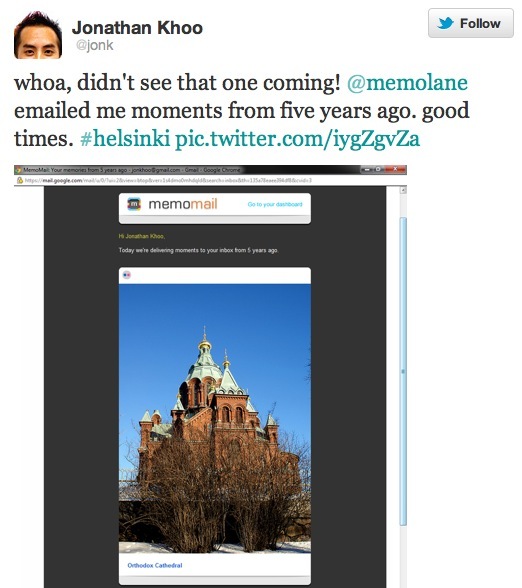 Launched in December 2010, Memolane offers a timeline-focused approach to reliving your past, as shared via services like Twitter, Facebook, Flickr, Foursquare, Spotify and more. The new emails, sent out to users for the first time in the past few hours, are likely inspired by the popularity of Timehop but dig further into your past and potentially support a wider range of services. 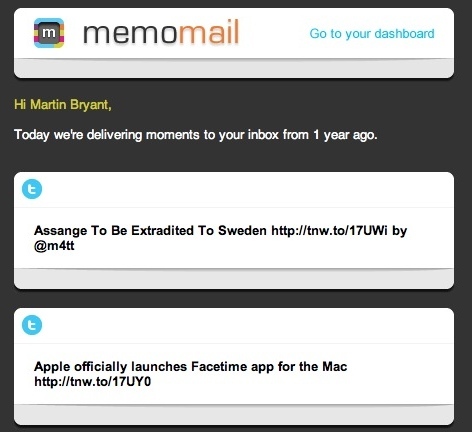 It’s unclear what types of content Memolane’s new ‘Memomail’ alerts support, but they appear to dip into your history rather than try to be comprehensive. I’ve got tweets and a Facebook status from last year in mine, while another user appears to have received Flickr photos from several years ago. However, launching the feature unannounced didn’t go down well with one user, who tweeted that he was reminded of an unhappy time in his life. Memolane apologised, but it shows that you have to be careful when sending unsolicited emails – even if they are of the recipient’s own content. On the upside, the new email alerts reminded us that Memolane exists. If you’re into personal nostalgia, we heartily recommend signing up.